Melting ice is visible near Greenland's Ilulissat glacier, one of the areas seeing the effects of global warming in the Arctic. The amount of Arctic sea ice has melted to a historic low, with the area of land covered by ice at the smallest level since scientists began observing it with satellites in 1972, researchers from the University of Bremen in Germany report. The North Pole skull cap shrank to about half a percent under the previous record low set in September 2007, according to the school's Institute of Environmental Physics. Researchers, including those from the National Snow and Ice Data Center, had predicted earlier this summer that Arctic sea ice levels could reach extreme lows. But the University of Bremen physicists said there was uncertainty in July about whether the ice melt would surpass the previous record. They said their studies indicated that continuing ice decline was related to man-made global warming. "It seems to be clear that this is a further consequence of the man-made global warming with global consequences," researchers said in their report. "Directly, the livehood of small animals, algae, fishes and mammals like polar bears and seals is more and more reduced." As Arctic sea ice has continued to decline, it also has become drastically thinner overall, the report said. The researchers said that previously the melting ice had been attributed to yearly weather anomalies. But now it is believed the massive melt is due in part to global warming and the increasing albedo effect, which has to do with the power of the surface to reflect sun. As more ice melts, instead of having white ice reflect more of the sun's rays, you have a larger amount of open water that absorbs those same rays. Therefore, warmer temperatures lead to even more ice melting. The National Snow and Ice Data Center did not have updated data to confirm the German report but said it expected the historic low to be hit based on the past few weeks' data. Its site is only up to date to September 6. The historic levels were reached two days later. The center said it would "make a preliminary announcement when ice extent has stopped declining and has increased for several days in a row" and said it would release monthly data for September early next month. The large-scale thaw is cause for concern, according to Shaye Wolf, climate science director of the Center for Biological Diversity’s Climate Law Institute. “This stunning loss of Arctic sea ice is yet another wake-up call that climate change is here now and is having devastating effects around the world,” Wolf said in a statement. 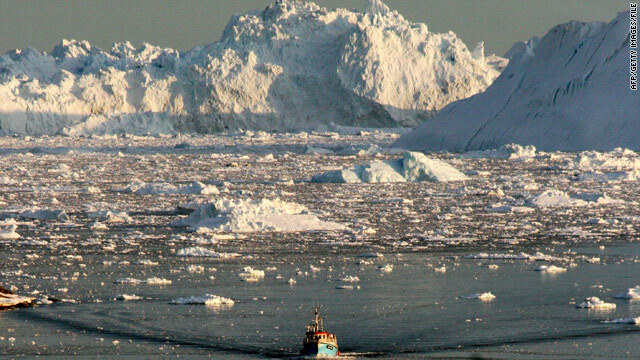 The receding ice is also opening up a war for oil resources. The Climate Law Institute noted the record followed news that this summer was the second-hottest since 1895. In 2009, studies began suggesting the Arctic Ocean could be "largely ice free" during summer within a decade. One of those reports, complied by the UK-based Catlin Arctic Survey and the World Wildlife Fund, showed that researchers predicted that within 20 years ice cover will be completely gone during the warmer months. And we froze our bajeezers off in the pacific northwest this summer! Oh yea, that would be climate change. Ahem... Data has only been taken since 1972. Wow! That is such a loooong time ago geologically speaking. Probably before you were born. Forget it. The earth will warm and cool at its own discretion no matter what we do because of that big ball of fire in the sky. Nope, I'll stick with the old religions and not the new. Bunch of earth worshipers that think they have the power to control everything at my expense... Take some time from your busy worship schedule folks and have several kids. That experience alone will bring new light to many of your current views and may change what you think is important. Most of you who constantly yell, "What about the children!" don't have kids or maybe one. You have no idea. This whole debate is a huge waste of time and money. Wish I had some of that Solyndra cash – it would have made a nice addition to my kids' college funds. 1. I have two children. I do not claim that my children will be seriously hurt in the next 40 years by this, although it's possible. I do claim that any great-granchildren will be seriously hurt by this over the 60 years after, and that perhaps half of my great-great-great grandchildren will die in the 60 years after that, unless things change dramatically in the next 30 years - and I will be one of the lucky ones. 2. I have heard the following argument about religion, which I will pass on to you. Our major religions believe that God created the universe, for a purpose (they also tend to believe that God wants us to be stewards of the world, but that's not relevant to this argument). This Earth is therefore a message from God, or, if you prefer, an endless manifestation of the truths that God wishes to convey. It is also the most accurate manifestation of what God wants: humans even when inspired by God often misunderstand the message, and what they say is often mistranslated as it is passed on over the years. Accurate "scientific truth" about God's universe, when available, is overwhelmingly likely to be God's truth - human error is squeezed out of it as much as possible, and it depends as little as possible on our fallible senses and thoughts. So when scientific truth tells you that there is a serious danger of causing the murder of more than half the human race unless we change our ways, and 80-90% of the land and sea life, and there is a possibility of ending all life on Earth by the "runaway greenhouse gas effect" that produced present-day Venus, that is a truth from God that, as far as I can see, is more sure and more important than any other. And to deny it or to ignore it, or to say that you can defer it indefinitely for any other concern, even the other things that religion teaches you to strive for, is a profound insult to the God that you claim to believe in. Look up the difference between weather and climate, Chilly. They're very different. Return to 5th grade and take Physics again. You failed this time around, Hello. The temperature at which (salt) water freezes (or melts) is a constant. Period. After so many attempts to scam us, why should we believe this report? The global warming cranks have been caught in so many attempts to misrepresent or create falsified data that acording to the polls, most people dismiss all of it. It's now beginning to appear as if this subject has been taken over by overzealous cultists and kooks. Even If there were any truth to be told about global warming, what reasonable person would still be willing to associate himself with it? You're putting a great deal of faith in a few emails which, as it turned out, weren't actually wrong, but were misrepresented by the oil foundation that's pulling the wool over your eyes. Global warming is the Eugenics of the 21st Century, and we all know how that turned out. Not quite as low as 2007. And the refreeze is starting sooner this year. GOd will protect us? Yeah, like he protected us from 9/11? This ice is clearly a part of a vast NWO conspiracy. I can clearly remember being cold for a couple of days in February, therefore global warming doesn't exist. That is what is supposed to happen when we are leaving a glacial period. If this condition were reversed, we would be heading into an ice age. This cycle has been happening for thousands of years. The only difference now is that it has become lucrative for man to try to label every weather and climate event. I double-checked and realized that this had not been completely covered by my previous comments. The last four Milankovitch cycles, at least, as established by the data, consisted of a rapid rise over a few thousand years from a minimum temperature to the maximum temperature (global average) of the cycle, then a more or less steady temperature over perhaps 20,000 years, and then a much slower decline over perhaps 70,000-75,000 years to the minimum. The glacial period happens over the last 10,000-20,000 years of the cycle. How it happens (and some of the evidence) is described in the book "The Fate of Greenland" (MIT). We are now close to the end of the warm part of the cycle - except that now we have moved clearly above the maximum of the cycle, and over the last 150 years the temperature has been increasing at an unprecedented accelerating rate. By unprecedented, I mean just that. There are no indications in the Earth's data of a rate of increase in temperature that results in a rise of 30-40 degrees Fahrenheit in 200-250 years. The closest is an indication that one such event took a minimum of 20,000 years. So, no, we are not leaving a glacial period; no, this is not what is supposed to happen when we are leaving a glacial period; this cycle has not been happening for thousands of years; the Milankovitch cycle, on the other hand, has been happening for at least 1 billion years; and if this were not happening, we could have expected a slow decrease in temperature starting some time in the next 10,000 years which would result in a glacial period starting some time around 60,000 years from now. I should also note that in the 1970s, shortly after human-caused global warming was identified, our present position in the Milankovitch cycle was also identified. This led to the completely erroneous belief among some people that scientists were saying that we would enter a new ice age some time in the next fifty years. 'Leaving a glacial period'? *looks around* Really? Where are the glaciers? The great ice sheets? The mastodons and the long-haired rhinos, and the giant sloths? The cave lions? This isn't a glacial period, genius. That was over tens of thousands of years ago. Know how I know? Because water wasn't locked up in giant sheets of ice, that's how. What flavour Kool-Aid did you drink? Interesting that when it gets really cold, the Gorebal Warming alarmists insist that Warming is not weather. But when it gets really hot, they say it is. NASA showed that Mars is also getting warmer, so who's emitting the GHG there? (1) Mars doesn't have an atmosphere. Therefore, GHGs in the atmosphere that reflect back the sun's light (bounced off the surface) to the surface and thereby increase surface heat are non-existent. (2) The light emitted by the sun, and therefore the heat that comes directly from sunlight (i.e., no bouncing) has been increasing at a rate of about 1 degree Centigrade or 2 degrees Fahrenheit per billion years. This applies to Mars as well as us. It is also likely that Mars goes through its own Milankovitch cycle - its orbit is elliptical, and probably varies in the degree of ellipsis, while it also probably wobbles around its axis - but we probably don't know what effects that would have, or what the periodicity is. Taken together, we are probably talking about a maximum 10 degrees Fahrenheit rise since Mars' early days from both causes (sun increase in heat plus peak of Milankovitch cycle). Rattling nice style and wonderful content, practically nothing else we want :D.